What you encounter on a Safari is a life time experience; imagine viewing over thousand wild animals and birds roaming freely in the jungle. 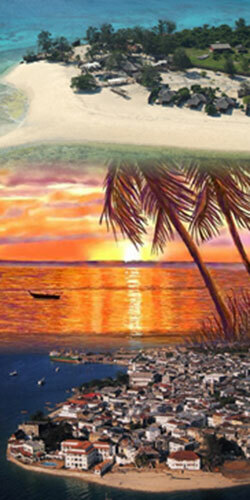 Check out our safari holiday packages or talk to our experts to structure a holiday for you. A stunning view of wildebeest at serengeti National park. On the left is a distance view of the Ngorongoro Crater and on the right, are the Gorillas at Bwindi forest national park in Uganda. 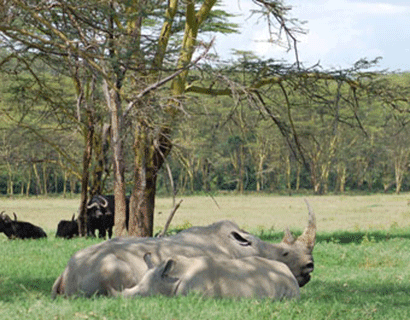 Some of the private and secluded conservancy at Masai Mara, a beautiful wilderness full of wildlife. 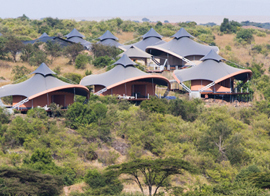 On the left is a luxury Safari honeymoon accommodation and on the right is a sunset view of the open plains of Mara. A stunning view of Mount Kilimanjaro peak. On the left is a luxury safari lodge in Lakipia and on the right is a close view of an Elephant in Samburu National Park. 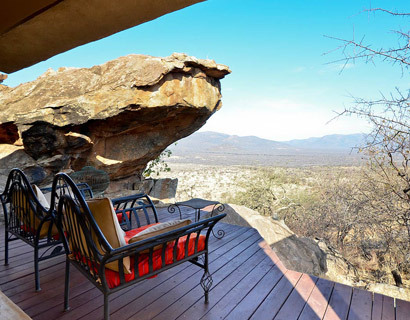 A nicely secluded safari suite, ideal for family holidays, honeymoons and private weddings. 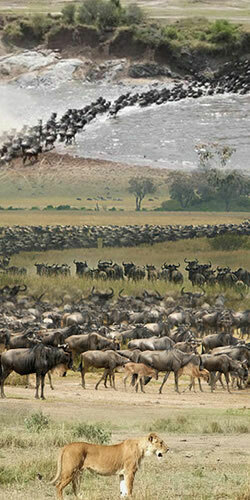 On the left is the Great Wildebeest Migration at Mara River and on the right is a morning hot air balloon safari flight. Thousands of pink flamingos on the shallow end of Lake Nakuru, bird watching is one of the major attraction at Lake Nakuru National Park, with over 400 difference bird species visiting every year. 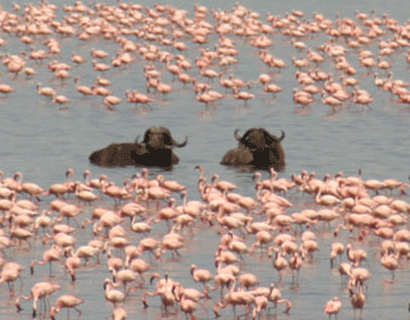 On the Left are the white Rhinos and Buffalo relaxing under the acacia trees, and on the right are the pink flamingos and buffaloes enjoying the shallow waters of Lake Nakuru. Safari is a Swahili word meaning 'journey'; the word is used to refer to a tour of wildlife and birds species at their natural habitat in Africa. 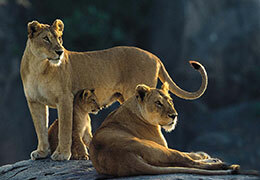 A safari holiday is no doubt a major attraction in Africa; it attracts millions of local and international tourist. 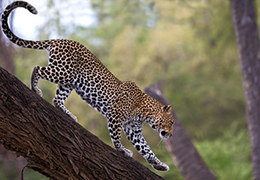 There are three main types of safaris holidays; wildlife safari, birds watching safari and mountain climbing safari or any combination of the three. 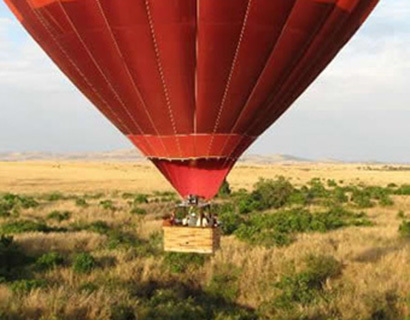 to make the safari more interesting, some add-ons like walking safari, fly in safari and hot air ballooning safari can be added to any of the safari types. 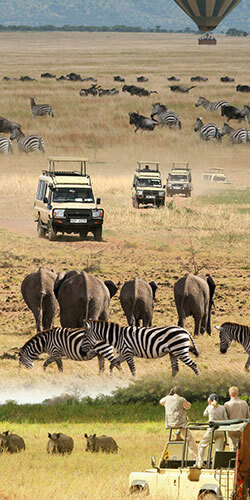 You can either join other people for a group safari or plan your own (Tailor-made or customized safari). 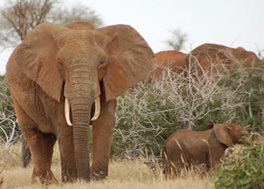 Group safaris is usually led by one tour guide and a support staff, accommodation varies from luxury lodges and camps to standard hotels, it is ideal for single travelers who wish to meet other people and avoid the large single supplement cost, the downside is that activities are done as a group and other people in the group may not get along. 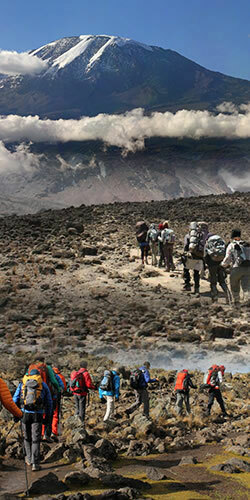 Most people prefer Tailor-made safaris, as they have the option to plan a safari that suits them; you can choose your own start date, duration, areas to visit, types of accommodations and activities to do. The Cost highly depends on what you choose; it could be as cheap as a group safari or expensive as a luxury safari; the choice is all yours. The options to plan your own holiday makes this type of safari famous and ideal for families, honeymooners and special holiday makers. 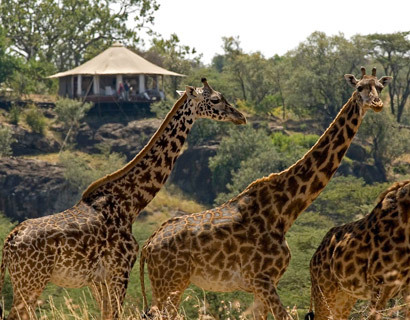 A well planned safari holiday can be exciting and full of memories that are forever cherished, to plan your safari; You need to pick out your major attractions carefully; what to watch, which game park, when to tour, type of accommodation and the cost. 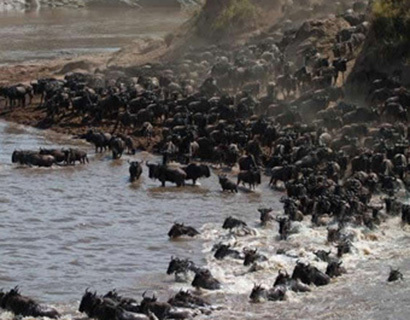 For example if you want to experience the famous wildebeest migration, you need to know when the migration is at Masai Mara or Serengeti; which Camps or lodges are closer to the river and how much it would cost you. 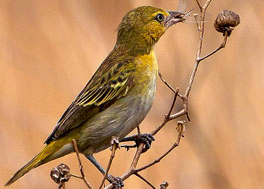 For the Big Five or other lesser known wildlife and birds species, you would need to know when and where to spot them. 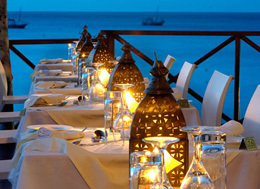 other factors to put into account is the Budget; in this aspect you need to think about the type of accommodation, which varies from the luxury 5 star Hotels and lodges to private and public tented camps. 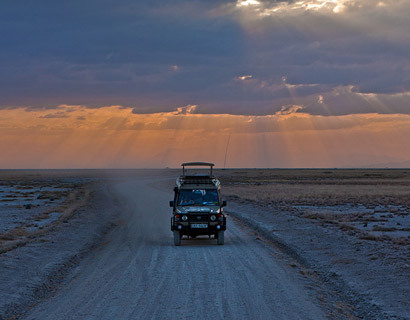 After that you need to decide on the mood of transport; whether it's a flying in safari, private open roof 4WD cars and vans, or shared group vans and mini buses. The best time to spot most wildlife is on the dry season, animal are easily spotted on the open plains and near rivers or water holes in search of food and water. Most countries in Africa have a dry season between January-March and July-October, this is the best time to spot wildlife. April, May and November are considered to be shoulder season with lesser wildlife. Bird’s watching is best in Octobers – November. On a normal safari day, you would wake up early for tea/coffee with snacks, before the sun rises head out for a guided wildlife viewing safari; at around 10am, the sun is usually hot and animals go to their hide out,so we return to the lodge/camp for breakfast and a brief rest. At mid day, you are free to use the hotel’s activities, or enjoy reading a book, take a nap, relax by the pool with a cold drink or go for a nature/cultural walk. The afternoon activities starts at around 3pm by taking tea/coffee/juice with snacks and then embark on an evening safari, some minutes before 7pm you will return to the camp for a refreshing shower before your dinner at 8pm, after dinner you can choose to go at the bar or around the fire place. Most guests retire to bed at around 10pm.There are numerous Safari activities, this is just to give you a sense of how a normal day on safari could be. 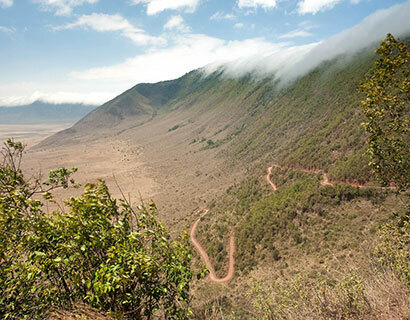 There are lots of information about safari holidays in Tanzania; from where to go, when to go, things to do, what to carry, what to expect and so on. 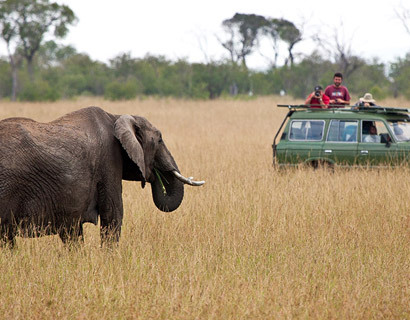 Below are helpful information to guide you plan your perfect safari holiday in Tanzania. 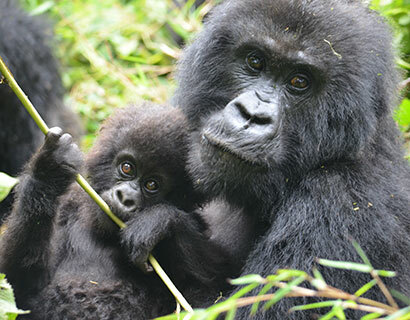 There are lots of information about safari holidays in Uganda; from where to go, when to go, things to do, what to carry, what to expect and so on. 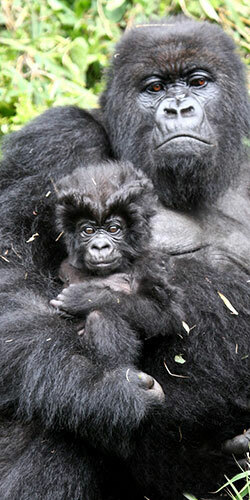 Below are helpful information to guide you plan your perfect safari holiday in Uganda. 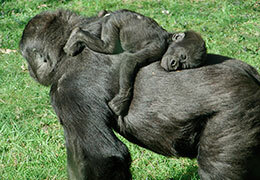 It is true that Budgeting for a safari holiday can be a hustle and painful. We at Kentz Safaris have broken down the cost in three categories (accommodation, transport and destination), to make it easy for you while calculating your safari holiday. 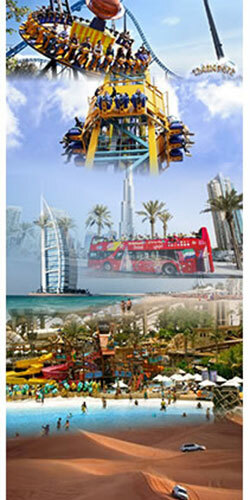 The three categories determine the cost of a safari and can vary quite substantially depending on what you choose. Accommodation is most paramount when deciding your safari holiday budget, beside the class of the hotel or lodge; other factors would include its location; hotels and lodges that are located inside national parks tend to cost more compared with the once located outside the park, also the smaller lodges with less number of guest would cost more compared to larger once that are said to be crowded with less privacy. Other factors that influence the cost, is the strategic location of the Hotel or lodge; Hotels and lodges situated on areas frequented by wildlife allowing guests to easily spot animals from their hotel's balcony tend to cost even more. Destination is also a paramount issue; the parks entry fee vary from park to park, for example if you want to view the big five all in one place, the best places to tour is places like the Masai Mara, Serengeti or Kruger national park; the parks are huge and have lots of wildlife, making them more expensive compared to Birds watching at Lake Baringo or Gorilla trekking at Bwindi national park. Other places that would cost more are the private conservations compared to public national parks. 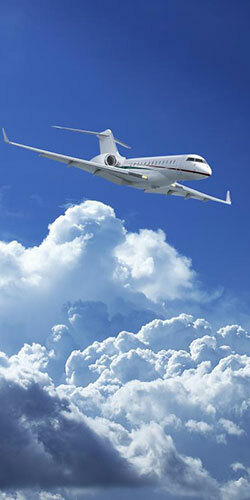 About transport, you are likely to pay more on luxury mode of transport like fly in safari and private 4WD cars compared to shared minibuses and vans or overland safaris. 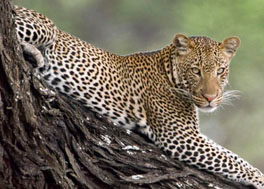 And finally the season(high or low) would also influence the cost of a safari holiday in Africa; for example, going to Serengeti or Masai Mara at the height of the Great Wildebeest Migration will cost you more than going at other times of year.Traveling on low seasons or last minute can also help you save some money and still view a great range of wildlife. Packing for your safari holiday can be a difficult task, below are some tips to help you out while preparing for your dream safari holiday. Firstly, you need a small bag (about 15kgs) to use while on safari, excess baggage can be stored in the hotel. Clothing colors are important while on a safari, we recommend you avoid bright and camouflage colors, put on neutral colors like khaki and olive. Good walking shoes and socks are a must to avoid discomfort and injury. Make sure you try them before your travel. Trousers can be won in the early morning and evening because it could be colder and also it would save you from the mosquitoes, the shorts can be used during the day when its hot and sunny. Long sleeve T-shirts are important, the long sleeves prevents your skin from the hot sun and the mosquitoes in the evenings. A swimming suit, most of the lodges have pools and the days are sunny and hot, nothing would cool you down than swimming. Other important stuff would include a sunhat, sunglasses and a waterproof/windproof jacket. Besides the personal supplies, other important supplies would include painkillers, Sun cream, insect repellents, a wildlife book, if you love reading (to read on your free time during the day), spare camera batteries and memory cards. To make sure you enjoy your safari holiday, we recommend that everyone to have a binocular and a camera with all its appropriate extras such as lenses and cleaner.